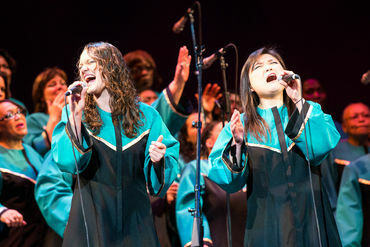 The Oakland Interfaith Gospel Choir’s mission is to inspire joy and unity among all people through black gospel and spiritual music traditions. The Choir’s exquisite harmonies and stirring gospel repertoire have led to performances with a wide variety of esteemed groups, such as Joshua Nelson, the Prince of Kosher Gospel; the Five Blind Boys of Alabama; and the Duke Ellington Orchestra. The Choir also appears on Grammy-winning albums by Linda Ronstadt, MC Hammer, Tramaine Hawkins, and others.